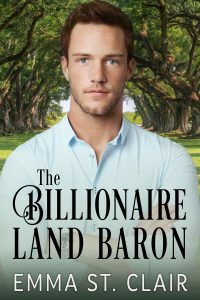 Jake is know as the Billionaire Land Baron for his ability to turn sleepy towns into luxury developments. When he arrives in Lucky, Texas to finalize details, he only intends to stay long enough to get the right agencies to sign off on his next project. When his car breaks down, he’s forced to stay in the only available room in town: an airstream trailer owned by a beautiful and feisty woman named Shelby. The longer he stays, the more the sparks fly. Until he finds out that her property is the last one needed to make his deal go through. Shelby is barely holding it together: caring for her disabled veteran father and working three jobs in a desperate attempt to keep their property. When she meets Jake, she sees a chance for escape–even if just for a few days. He’s about the only thing that brings her comfort and gives her hope when the bank tells her they are repossessing her house. Jake wants nothing more than to protect Shelby, but his career is riding on this deal. Can he save both? And when Shelby realizes who Jake is, will it even matter? SIGN UP TO BE THE FIRST TO KNOW WHEN THE BOOK IS READY! Want to also receive my weekly clean reads newsletter? Click below! You will get an email when the book is ready!